This project's objective is to restore 10 acres of tidal wetland through the removal of 60,000 cubic yards of clean, sandy dredge sediments from a former tidal marsh. These sediments will be placed on adjacent areas where fill is currently up to 6 feet in depth. Preliminary site assessment involved sediment testing, and results showed the sediments were clear of contaminants and suitable for re-use on site. Five acres of restored tidal wetland will be low marsh, and three acres will be high marsh. Two acres of ponds will be constructed. The Connecticut Department of Environmental Protection’s Wetland Restoration Unit will construct the project. No marsh plantings will be done since experience with previous excavation projects (e.g. Hammonasset State Park in 1999- 2000; Mumford Cove 1989) has shown that if the proper tidal hydrology is achieved, marsh plants will naturally re-colonize the site. Incentive Program funds for seeding the area around the restored marsh with warm season native grasses such as switchgrass (Panicum virgatum) and little bluestem (Schizachyrium scoparium). A total of five acres of coastal grassland will be planted. DEP and NRCS will monitor the restoration progress. The Lower Connecticut River is an important feeding and stopover area for migratory birds, as illustrated by its designation as a Wetland of International Importance. The Connecticut River wetlands have been identified as regionally important American black duck (Anas rubripes) habitat under the North American Waterfowl Management Plan. As shown on historical maps from the late 1800s, this site was formerly a brackish meadow tidal wetland with a large tidal pond. Sandy dredge sediments from the Connecticut River channel were disposed in the marsh and pond in the 1940s. The tidal wetlands were filled with the dredge sediment and converted to non-tidal uplands. The invasive species Phragmites australis now dominates the site. This filled wetland has lost all ecological functions and values normally provided by a tidal marsh. The uplands historically consisted of maritime shrubland and forest until the Lynde Point peninsula was cleared for farmland in the 1800s, and today only a remnant of the habitat remains. Surrounding the proposed restoration area is 10+ acres of scrub shrubland, lowdensity residential housing and barrier beach. Restoration of the marsh at Lynde Point will provide open water, panne and brackish meadow habitats that will benefit many species of migratory waterfowl, wading birds, shorebirds and nesting passerines. Black ducks and other waterfowl will benefit from this project because the open water habitat to be restored will increase invertebrate and plant food sources and provide additional area for resting and feeding during migration. The proposed restoration work at Lynde Point will improve habitat for many Federal and State listed species. Populations of small forage fish will be enhanced, and these baitfish, e.g. mummichog, striped killifish, sheepshead minnow, Atlantic silverside, and inland silverside. Increased abundance of these forage species will enhance the estuarine food web and result in greater prey resources for numerous finfish, including the Federally endangered shortnose sturgeon and the state threatened Atlantic sturgeon. Other species that will be positively impacted by restoration of this important habitat include the bald eagle, the northern harrier, the northern diamondback terrapin, seaside and saltmarsh sharp-tailed sparrow, and willet and glossy ibis. OWNERSHIP: The Borough of Fenwick holds title to the land. 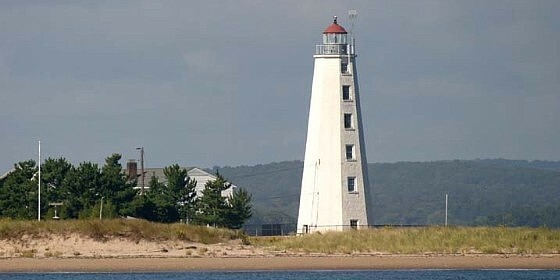 The Lynde Point Land Trust holds the conservation easement in perpetuity. PARTNERS: This project is a collaborative effort between the Lynde Point Land Trust, the Borough of Fenwick, the Connecticut Department of Environmental Protection, the U.S. Fish and Wildlife Service, Ducks Unlimited, NOAA National Marine Fisheries Service Habitat Restoration Center, Natural Resources Conservation Service, and the CT CWRP. Conservation Grant (USFWS) of $80,000 was awarded for this project. 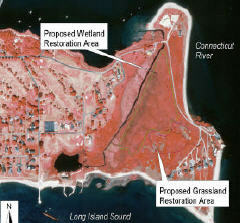 Ducks Unlimited Aerial View of Lynde Point in Old Saybrook, CT. and NOAA are together contributing $30,000. Additional funds and in-kind services will be provided by CTDEP, NRCS, USFWS, the Borough of Fenwick and the Lynde Point Land Trust. The total project cost is $221,000.